Pre-technological innovation, musicians who wanted to write and record material had to meet face to face, and hash things out. Over the last two decades or so, thanks to lower home studio costs and internet connections with faster computers, setting up a project with members globally is at your fingertips and only requires the will, finances, and/or time to make it happen. 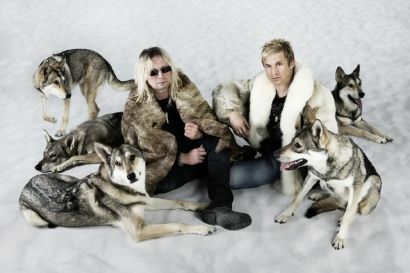 Since 2011 Wolfpakk has been an all-star oriented melodic metal project, the creation of two musicians Mark Sweeney (ex-Crystal Ball) and Michael Voss (Mad Max, Michael Schenker) – as Wolves Reign represents the fourth installment. 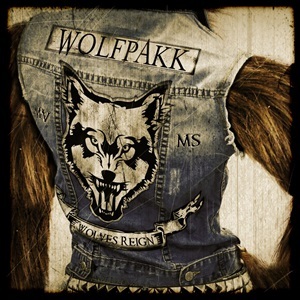 Containing 23 guests between singers, guitarists, bassists and drummers, rest assured these 11 songs possess premiere talent across the hard rock and metal spectrum – the question is, what makes Wolfpakk special or unique in the melodic metal field? The songwriting ebbs and flows between straight ahead melodic hard rock and slightly melodic heavy metal with occasional power strains – as Mark and Michael pick the sweet spots for the musicians they’ve assembled to place in those ideal tracks. Native American chants and percussion twists lead “Blood Brothers” into a cultural metal landscape, featuring Biff Byford of Saxon as an early first half highlight, a larger than life chorus and chant worthy background passage inducing devils’ horns and modest headbanging. Uplifting Teutonic oriented keyboard/guitar riffing puts “No Remorse” in the power metal glory camp, Oliver Hartmann’s upper register vocals and double bass bringing it all home, while “Scream of the Hawk” contains Firewind/Ozzy-like guitar parts and Steve Grimmett’s metallic melodies contrasting against Michael and Mark’s grittier textures. While most of the songs reside in a comfortable four to six-minute timeframe, “Mother Earth” at 8:22 is more of an epic, bombastic-laden arrangement featuring Ronnie Atkins of Pretty Maids delivering a majestic chorus, but the instrumental section plods along in that old Dio-esque Sabbath manner without really going anywhere. Notable names sprinkled about include Timo Sanders, George Lynch, Brad Gillis, Rudy Sarzo, and Alex Holzwarth – but in the end, Wolves Reign doesn’t really stray much from a proven formula of mid-tempo anthems, big choruses, and wheelhouse performances. Star power for sure, but once again you’d just hope they would reign in the hefty guest format and focus a little more on stronger, diverse hooks for a better outcome.